Now that I'm a bit more mobile (cast is off the ankle) I've been able to get into the studio and do some much needed cleaning, organizing, and catching up. In doing so I came across some blocks that had been pieced into an attic windows setting a number of years ago. The blocks had come to me through a block exchange. Oh my word!!!! Some of the blocks had been signed and showed a date of 1994!!! 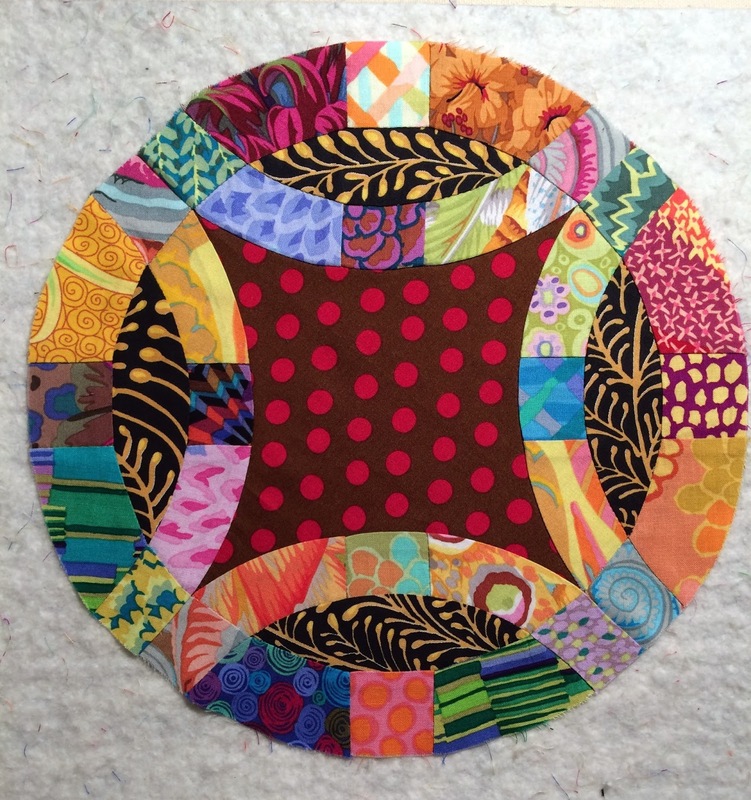 It was definitely time to get this flimsy sandwiched and quilted. I managed the sandwiching and decided to send it out to my local long-arm quilter to do it justice. Voila!!! It's finally completed and looking at each of the blocks brings back memories of the online conversations we had during this exchange. I've called it Windows on the World because the blocks came from everywhere. 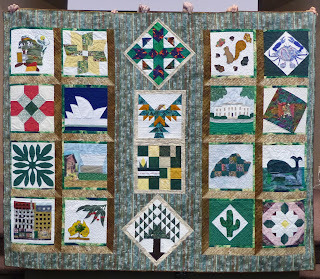 Starting in the upper left blocks were from Wisconsin, Nebraska, New Mexico; Vermont, Maine, California, Australia, New Mexico, Illinois, California, Hawaii, California, Nebraska, Singapore, Connecticut, France, Australia, Maine, Arizona; and me, representing British Columbia. 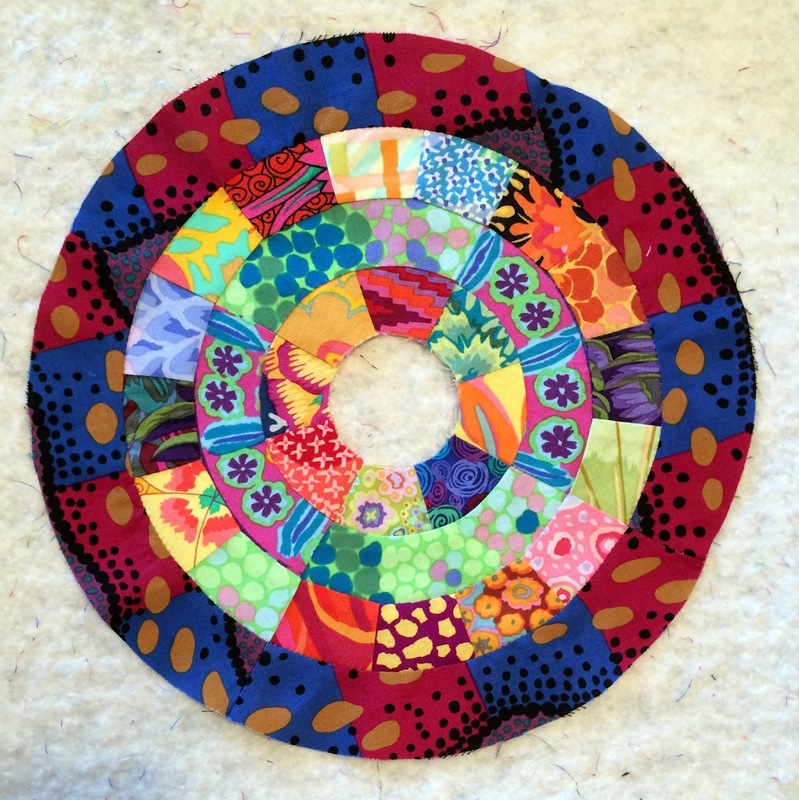 Well since the last post, I've been keeping myself busy completing more circles from Jen Kingwell's Circle Game. 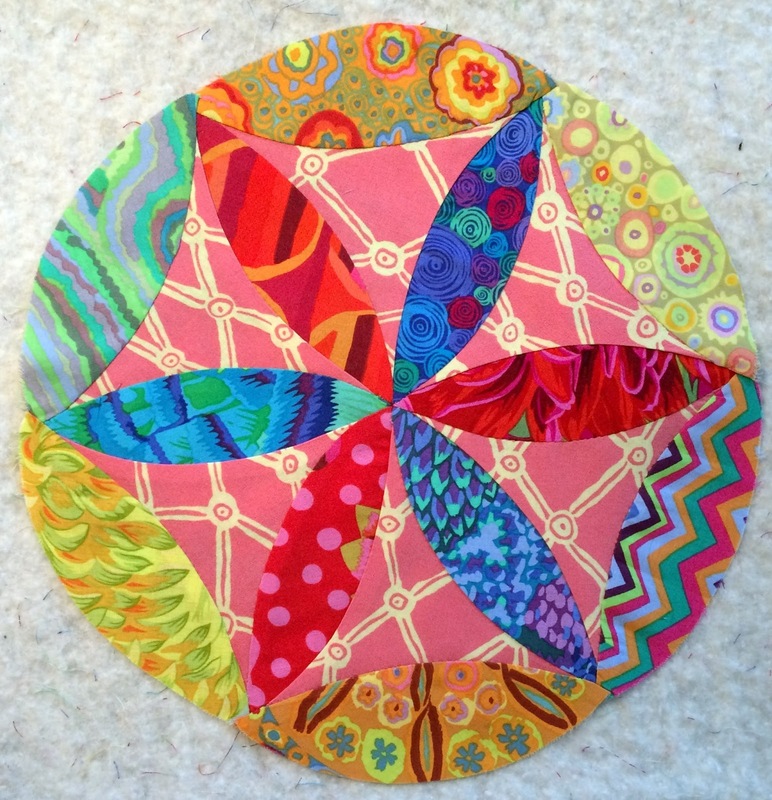 I've discovered that the hand piecing is quite enjoyable and very relaxing. It helps while away the hours spent sitting around the house with a broken ankle. Here are some more that I've completed. 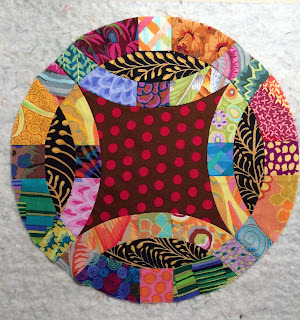 This last one, with 32 individual patches, still needs the centre circle, but it will have to wait for now. 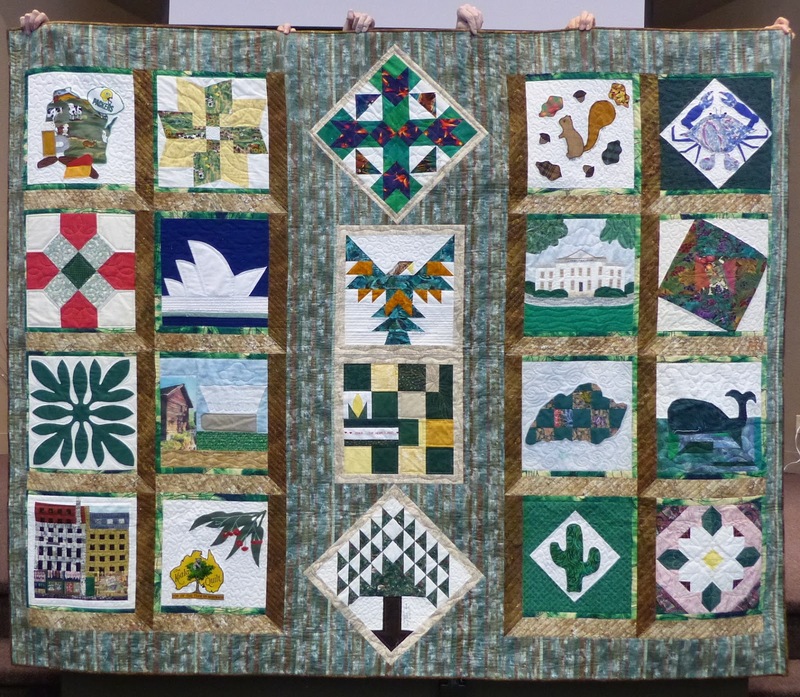 This BOM initially organized by Di-Versity Quilting Supplies in Pritchard, BC has been quite a challenge but at the same time a wonderful tool to practice the use of templates and accurate hand piecing. I'm enjoying every minute of it, and may just take on another one that has been sitting in the cupboard for some two years now. Thanks for stopping by and having a peek. Let me know if you have attempted this pattern or any other that you are hand piecing. We have all become so accustomed to our sewing machines with the various "bells and whistles", me included. It isn't until you are not able to get to it that you begin to come up with ways to continue stitching without relying on your, Pfaff, Bernina, Janome, Juki, Elna and what have you. I recently suffered a fall that resulted in a broken fibula. Off my feet for at least two weeks with an air cast; can't put any weight on it; gotta continue in the same cast for an additional 6 weeks after that. Great! and I had so many plans for finishing all those WIPs sitting under the sewing table. 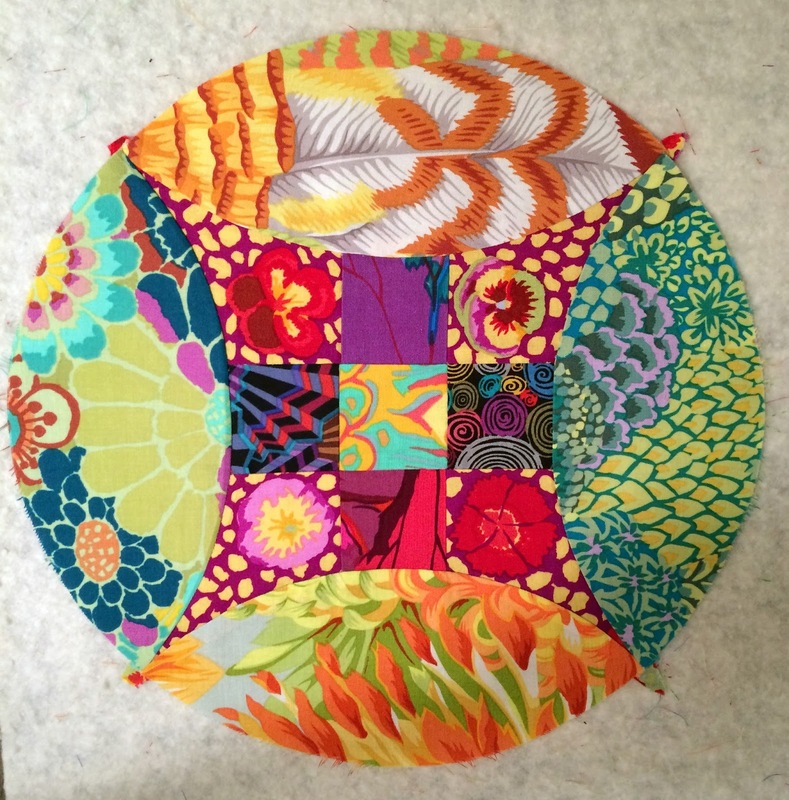 While sitting on my couch I spied a bin with colourful Kaffe Fassett fabrics, a pattern book by Jen Kingwell titled Circle Game. Ah Ha!!! This was supposed to be one of my bucket list items; completely hand piecing a quilt top. Look at this; I even started cutting some of the templates. So I started the first one. I'm doing the circle portion of all the blocks first. Once all 16 are done, I'll do the surrounds and then the borders. Say this hand piecing isn't so bad, and I can still get some stitching enjoyment. Oh look here is the second one. May as well keep going. Block 3 looks like the same construction more or less. What do you think of the colours on this one? Okay this next one is a bit more fussy. Hmmmmm....done!! Oh not quite. Still need to add an applique circle for the centre. I'll get that tomorrow. This next one has got some inset seams which should be relatively easy. Done!!! Well that was a productive two days. Tomorrow is another day. Thank you for stopping by and having a peek. Let me know your thoughts or if you have completed this pattern.